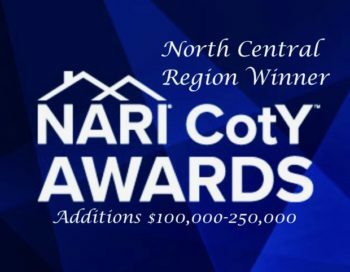 Feb. 1, 2018 – APEX Construction Management was named 2018 Regional Contractor of the Year (CotY) today for residential additions $100,000 to $250,000 for a unique Laurel Ave., St. Paul, project it completed last fall. Regional judges from the National Association of the Remodeling Industry (NARI) chose the APEX entry in the three-tier competition. APEX first won at the state level last November. As winner of the North Central Region title this week, it is a finalist for the 2018 National Contractor of the Year title. 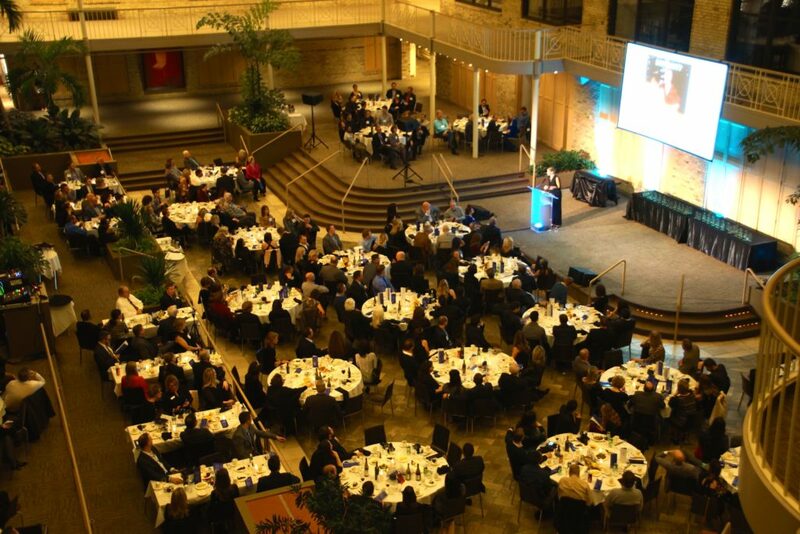 That winner will be announced at the association’s Evening of Excellence event in Charlotte, NC, on April 20. This is APEX’s Construction Management’s third Contractor of the Year recognition. NARI MN President Jennifer McAlpin congratulates JB on his 2018 Regional CotY win. The project appears in the current issue of the Pioneer Press’s glossy SPACES magazine and is featured on Houzz. You also can see the remodeling and speak with APEX owner John Biancini and project designer Carmin Meyer during the Spring Remodelers Showcase Tour, March 23-25, in conjunction with the Parade of Homes. Carmin worked with Modern Design for the custom cabinetry. APEX designed and built the rear addition at the 1912 home of Richard and Shirley Erstad. APEX annexed a small corner porch to square off the new kitchen and bumped out the foudation and main level for a new entry area, three-quarter bath, porch and basement laundry. Outside, APEX used narrow lap siding with mitered corners, salvaged turned porch railings and mirrored roof lines for a seamless transition between new and existing spaces. But the real drama unfolded inside. The Erstads view homes as “durable goods” that should be enhanced over time without erasing their past. While they wanted all the conveniences of a modern kitchen, it had to look and feel like something out of the 1920s. 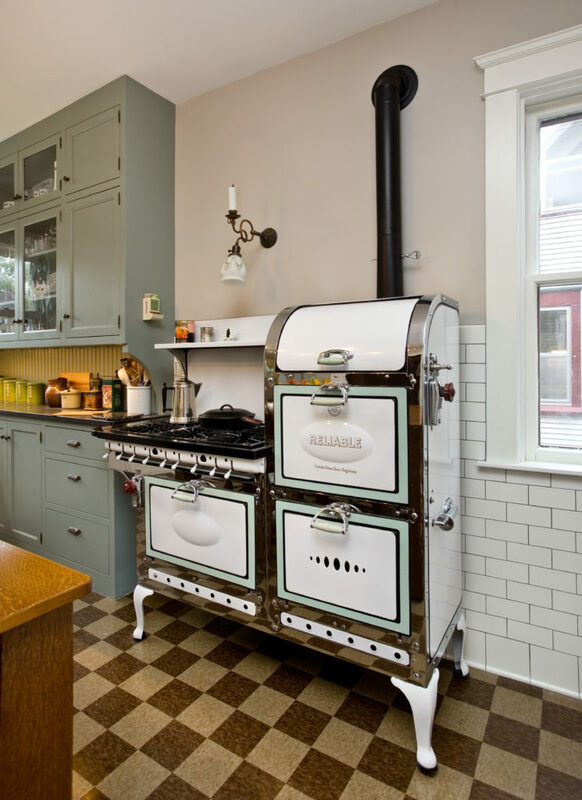 A fully restored eight burner, three-oven 1920s Reliable gas stove and a vintage Monitor refrigerator anchor the design. Complementing them are freezer drawers and a microwave oven hidden in the custom cabinetry. The new kitchen features green, white and natural cabinets and both marble and granite countertops to suggest that storage was added over time. A center island would have looked out of place. So Modern Design built a large table with drawers, which Richard finished himself. “This was a challenging project and very much a team effort,” John recalled. He credits Project Manager Matt Grudzielanek for overseeing trade partners and Carmin for ensuring that the nostalgic elements would come together visually and provide needed functionality. He also acknowledged the homeowners themselves for their research and skillful DIY contributions. The CotY Award judges apparently agreed. The 26 NARI judges evaluated more than 400 projects from eight regions with a value that exceeded $123 million. 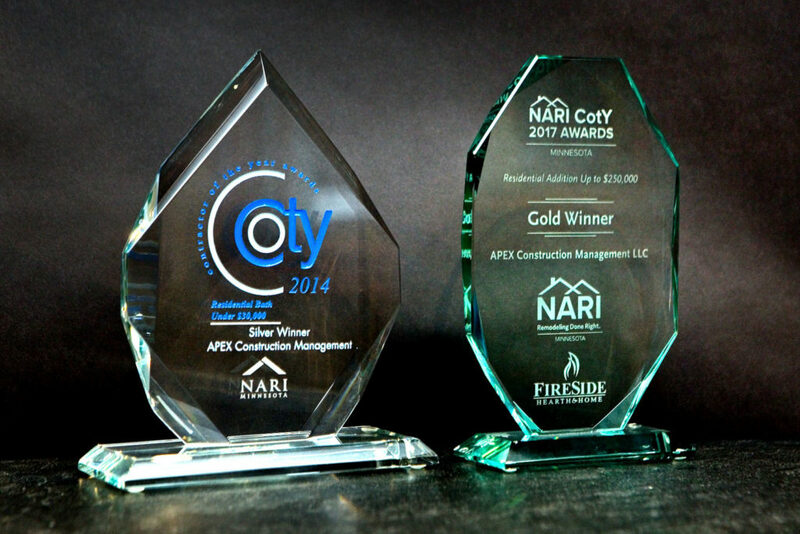 NARI officials said CotY Award winners “demonstrated remodeling excellence.” Judges considered functionality, problem-solving, aesthetics, craftsmanship, innovation, degree of difficulty, and entry presentation. Each year at this time, Remodeling Magazine publishes its annual “Remodeling 2018 Cost vs. Value Report” on the average cost of 21 popular remodeling and replacement projects and the value each would retained at resale. 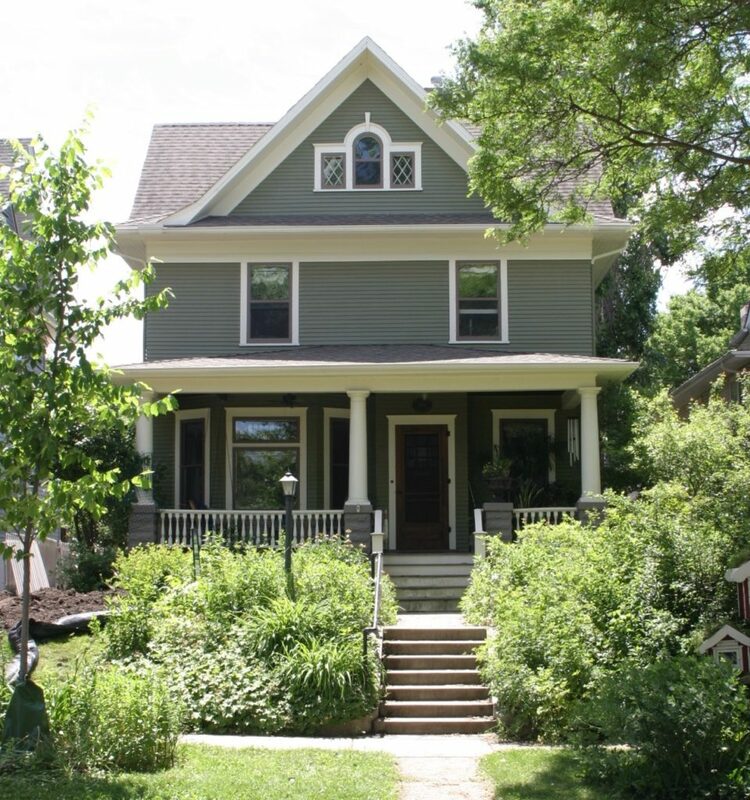 Not surprisingly, lower-cost curb appeal projects dominated the top 5 list. The survey said installing an upscale garage door would actually be worth 12.6 prcent more than its $3,591 Minneapolis market cost. A $1602 midrange-quality steel entry door would hold onto 93 percent of its value. Replacing 300 square feet of vinyl siding with manufactured stone veneer around the entry would retain 91% of its $7,996 cost for third place. Number four was adding a $12,735 16×20 pressure treated wood deck at 79.7 percent. The only interior project was fifth-ranked mid-range quality Minor Kitchen Remodel. The report said it would retain 72.7 percent of its $24,351 cost. According to research by RemodelMAX, 2017 labor and materials costs for a bathroom addition increased the most (6.5 percent) of the 21 projects from 2016. The price of a minor kitchen remodel rose the least at 2.7 percent. The Remodeling Cost vs. Value Report findings are useful for homeowners to get general idea of what projects might cost in the Minneapolis market. And the payback estimates could help them avoid over-improving their homes if they plan to sell in the coming year. However, the authors warn that the data was assembled last summer and fails to take into account significant lumber price increases our market experienced this past fall. 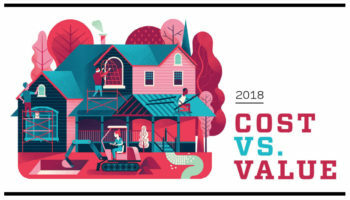 Complete data from the Remodeling 2018 Cost vs. Value Report can be downloaded free at www.costvsvalue.com. Remodeling is a journey, some would say an odyssey. But nothing dictates that you must travel the route nonstop. Over the years, I’ve met many homeowners who were reluctant to start down the remodeling path because they weren’t quite ready to commit to spending money on construction. In reality, we would have to cross a number of bridges before we would be prepared to build. So I suggest starting the first leg of the trip sooner and reserving an informed construction decision for later. By initiating preliminary discussions in January or February, you will be ready to move forward with construction in late winter or early spring when others are just getting started. 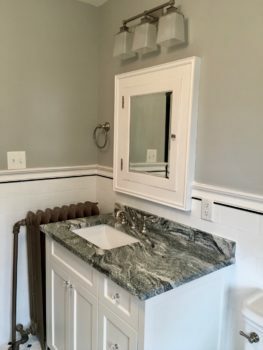 In our high demand remodeling market, that can make the difference between completing your project in April before grad parties and weddings or waiting until September. The first step in APEX remodeling projects is to establish goals and get comfortable with each other’s communication style. The communication component is especially important for me because I am profoundly deaf and must read lips. Expect my full attention when we meet. I do have a special office phone that enables me hear most callers when I’m at my desk. As a General Contractor, our goal is to manage the remodeling process for the smoothest client experience and for the completed project to enhance the quality of life at home for the people we serve. Time spent assessing goals and preferences is critical to achieving this end. Our first “deliverable” typically is an initial design and preliminary budget estimate. We’re good listeners, but it’s not uncommon for homeowners’ remodeling visions and initial cost expectations to misalign this early in our discussions. When that happens, we explain the various expenses and, if needed, offer options to narrow the gap without compromising quality. With agreement on the general project roadmap, we will schedule a trade partner preview to confirm the project costs and help drive a more accurate project budget and timetable. Now that we know what is included, how much it will cost, and how long the project will take, we can schedule construction immediately or put it on hold for a couple of months. You can’t make an informed decision about remodeling until you have a scope of work, project budget and timetable. Ready for Step One? John Biancini and Carmen Meyer with CotY Award. 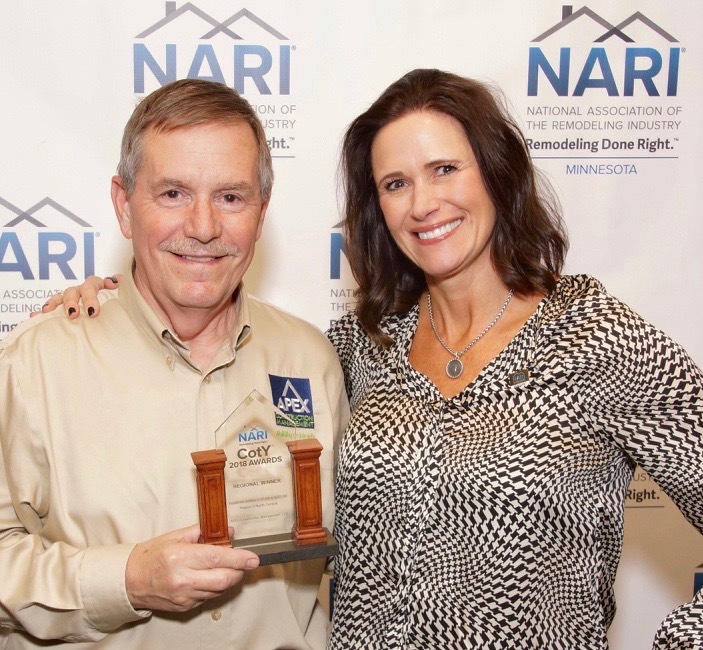 The National Association of the Remodeling Industry (NARI) has named APEX Construction Management a winner of the 2017 Minnesota Contractor of the Year ( CotY ) Award. APEX received the top, gold-level honor for Residential Additions under $250,000. It beat Schrader & Co., Edgework Design Build and Jones Design Build for the state title. 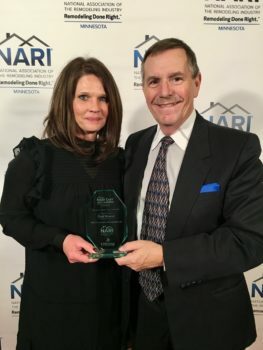 NARI recognized contractors in a total of 25 CotY categories plus best in show and best newcomer at its annual Gala at International Market Square on Nov. 16. APEX President John “JB” Biancini and designer Carmin Meyer accepted the crystal trophy. They were cheered on by more than 300 colleagues and guests, including Troy Eiden of Modern Design, which built the custom cabinetry for the project. Vintage look with 2017 amenities. APEX won its latest CotY Award for a unique addition it built at the Laurel Ave. St. Paul home of Richard and Shirley Erstad. APEX expanded the kitchen, enhanced the rear entry and added a three-quarter main level bath and lower level laundry. 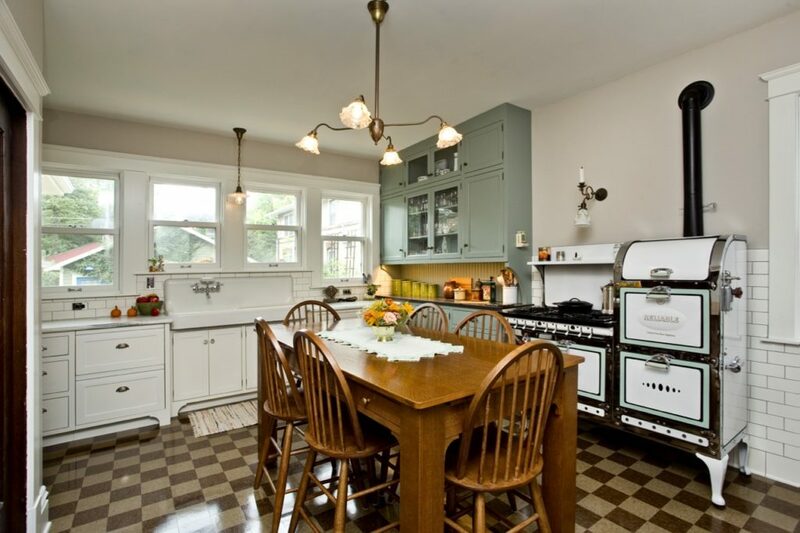 The primary challenge was to create an authentic looking 1920s kitchen for the couple’s painstakingly restored vintage gas stove and refrigerator and antique fixtures. 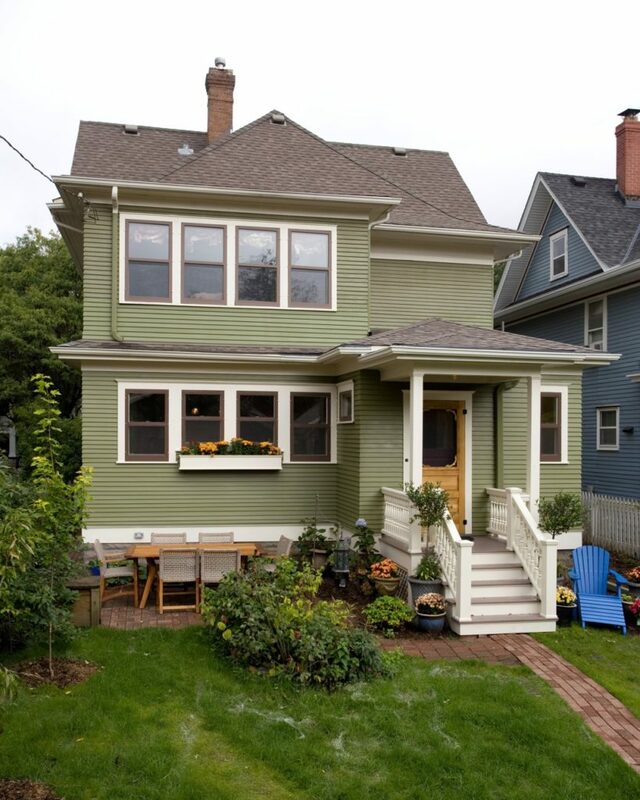 From the storybook backyard, the addition needed to blend in seamlessly with the home’s 1912 architecture. Rear porch moved from left and blends seamlessly. JB, Carmin and the clients worked closely to conceal modern conveniences from view. For instance, electrical outlets are tucked under the upper cabinet rather installed in the backsplash and Sonos Wifi speakers are installed in vintage radio cabinets. Meanwhile, the freezer, dishwasher and microwave are hidden behind cabinet doors and drawers. And the antique wall phone actually works. Outside was all about making the addition look like it was part of the original architect’s plan. New Marvin windows and the addition’s rooflines reflect the style, scale and period of the original architecture. The relocated entry porch features an ornate, reclaimed balustrade and classic beadboard ceiling. And lap siding was installed with true mitered joints rather than the more common corner boards. APEX’s Matt Grudzielanek managed the construction. Plan to tour the project for free during the spring 2018 Parade of Homes Remodelers Showcase. At APEX, we love the challenge of remodeling century-old homes, making everything fresh and safe while preserving the period charm. Luckily, we’ve had plenty of opportunities this year. 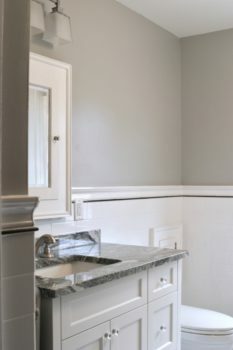 Here is a St. Paul bathroom we recently renovated for some great new clients who discovered APEX on Angie’s List. 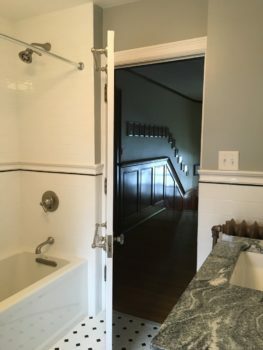 The owners, Curt and Susan, wanted to restore their 1924 upper level bathroom (and the water stained living room ceiling below). But first we needed to address code issues. That meant running all new plumbing supply lines and electrical cables from the basement and replacing an overburdened fuse box with a properly sized circuit breaker service panel. The old hot water line was completely blocked so we installed new PEX lines to all of the fixtures. We also added ground-fault protection for the electrical outlet. 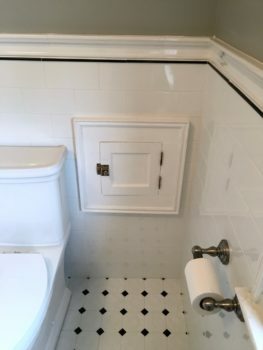 The old bathroom lacked storage so we built a partition wall at the foot of the new soaking tub/shower and designed a custom, built-in, floor-to-ceiling linen cabinet and comfort height vanity. 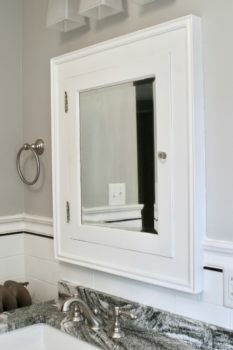 Curt and Susan wanted to keep the original window, built-in medicine cabinet, and chute to the basement laundry, so we mirrored their style in the new cabinetry and the all-tile shower niches. 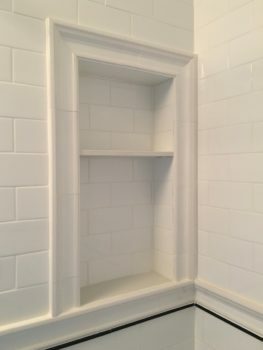 The new white subway tile that wraps the lower wall is larger than before, but Curt and our tilesetter collaborated to select narrower tiles above the decorative chair rail to give the bottom more visual weight. 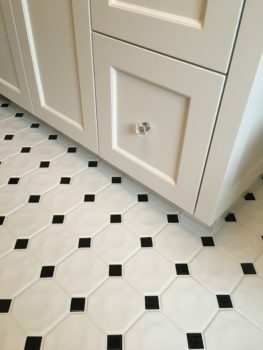 We also chose a larger mosaic for the floor tile for the same reason. 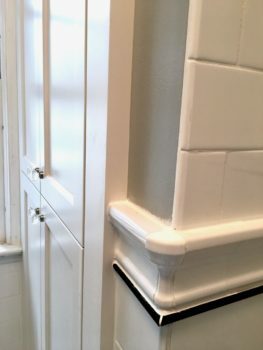 The original chair rail was accented with blue pencil tile. 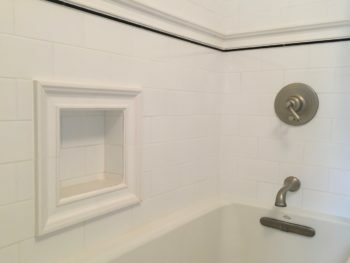 Susan opted for a black pencil detail in the new bath for a more neutral touch that would accommodate future decorating. Although large, luxurious showers are popular in bath remodels today, Susan preferred to stick with the tub shower configuration for versatility and resale appeal in this main hall bath remodel. “The house is meant for families, and it is a lot easier to toss a kid in a tub,” she explained. But the new tub needed to be as deep as the old cast iron tub for soaking. With the living room ceiling repaired and repainted, the home’s extraordinary main level woodwork is back to its former grandeur. 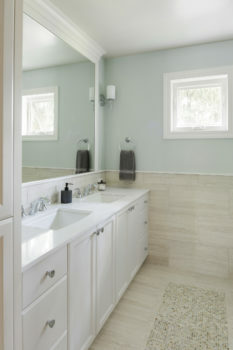 Susan told Guild Quality, “We are totally satisfied with our APEX bath remodel! Working with Matt and JB was a breeze.” The feeling is mutual. We look forward to returning to remodel the master bath. 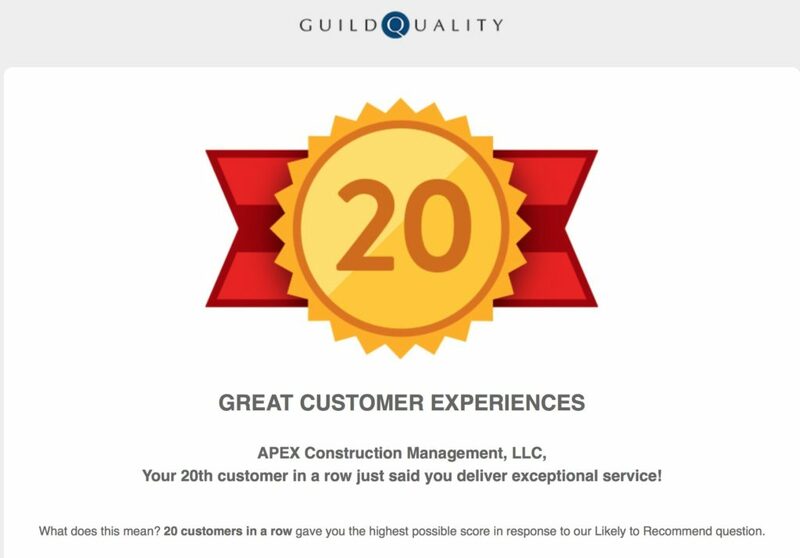 Thank you to all of our APEX customers who take the time to share their experiences through online reviews and these Guild Quality surveys. Guild Quality starts by emailing its survey. If the survey is not completed, it tries again. If that doesn’t work, it calls. And finally, it mails a postcard reminder. APEX reviews appear on many online platforms, including the APEX reviews page, Google, Houzz, Angie’s List, the Better Business Bureau, Home Advisor and Facebook. The Guild Quality survey is the most time consuming and important because it asks multiple questions. But most people can complete the survey in less than five minutes. The other reviews go even faster. Repeat business and referrals are the cornerstones of how we have built APEX. 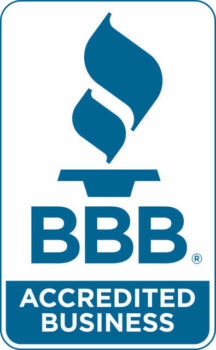 These customer satisfaction surveys and online reviews are what keep us on course. Thank you. 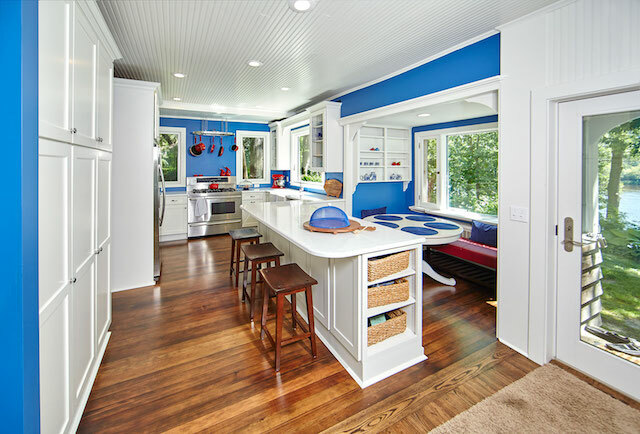 Recent Houzz article on bold APEX remodeling of St. Croix River kitchen. HomeAdvisor, the company that sells leads to contractors and bought the online reviews platform Angie’s List this year, is betting that homeowners will prefer them to recommend qualified remodelers than to qualify companies on their own. However this Vadnais Heights story suggests the time-honored approach of asking family and friends for referrals still is going strong in Minnesota. Scott and Jean Crow had first learned of John “JB” Biancini and his company APEX Construction Management from neighbors who had used him and whose sons were friends. After meeting JB and seeing his website and work, Jean was impressed enough to refer APEX to her sister for a big remodeling project. Then she and Scott had APEX raise and remodel their sunken living room and install new Marvin windows throughout the main level a few years ago. And this year APEX returned to replace their upstairs windows and remodel their master suite. The Crows also elaborated on their Master Suite project in this video. Minneapolis Architect Meghan Kell designed the space. Many contractors aspire to be your “contractor for life.” Based on the steady flow of repeat business and referrals, APEX actually pulls it off. It takes more than the ability to drive a nail and saw a straight line to be a successful General Contractor. JB put the words “Construction Management” in his business’s name for a reason. He’s a process guy from his long career in technology. He knows good intentions only get you so far in remodeling. Repeatable, reliable quality also takes good process and mutual trust. “What I like about personal referrals is that they are based on the actual experience of people whom I respect and trust. They know my standards and I am confident they will not suggest someone who will fall short. APEX clients feel the same way,” JB explained. Many homeowners think the most important thing they can do to obtain a fair remodeling price from a good contractor is to get three bids. In reality, competitive bidding is a small part of the process of finding the right remodeler. Establishing trust should be your top priority. 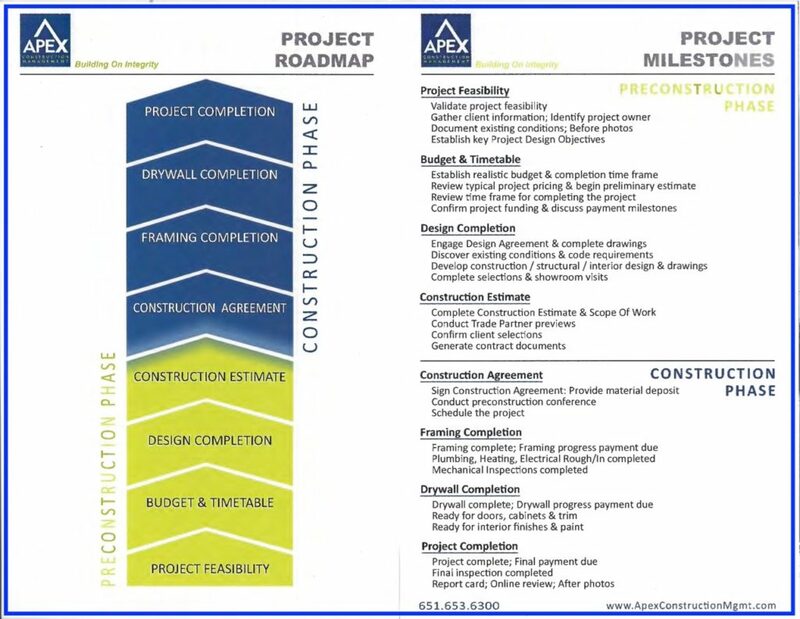 APEX Construction Management’s JB Biancini suggests you start by checking project photos and friends’ projects. Do you like what you see? Next consider online reviews and personal referrals. Do you like what you hear? Finally, meet with a couple of contractors who clear those two hurdles. Do you like what you feel? That’s when you decide if you can trust the contractors and if they listen. Although intangible, mutual trust is the most important building material in any successful remodeling project. We caught up with JB at a St. Paul job site. Here’s how he explained it. If you have questions, contact JB.